The Royal Navy’s Northern Ireland Squadron was established during the troubles to interdict the movement by sea of illegal arms and to provide other material support for anti-terrorist operations in Northern Ireland. The squadron was moved to HM Naval Base Clyde in 1993 but Navy retained use of a jetty in the Musgrave Channel adjacent to Moscow Army Camp in Belfast Harbour. In 1993, River-class minesweepers, HMS Blackwater, HMS Spey, HMS Arun, and HMS Itchen were assigned to the Northern Ireland Squadron where they replaced Ton-class minesweepers. The River-class vessels were replaced in 1998 with Hunt-class mine countermeasures vessels. The squadron’s disbandment was announced on 23 March 2005 as part of the process of normalization which follows the 1998 Good Friday Agreement. The last three ships of the squadron, the Hunt-class ships HMS Brecon, HMS Cottesmore, and HMS Dulverton, were decommissioned on 19 July 2005, just a few days before the Provisional Irish Republican Army completed the decommissioning of its weapons and called off its armed campaign. She was launched in 1937 to support the increasing numbers of submarines, especially on distant stations, such as the Mediterranean and the Pacific Far East. Her equipment included a foundry, coppersmiths, plumbers and carpenters shops, heavy and light machine shops, electrical and torpedo repair shops and plants for charging submarine batteries. She was designed to look after nine operational submarines, supplying over 100 torpedoes and a similar number of mines. Besides large workshops, there were repair facilities for all material in the attached submarines and extensive diving and salvage equipment was carried. There were steam laundries, a cinema, hospital, chapel, two canteens, a bakery, barber’s shop, and a fully equipped operating theatre and dental surgery. In October 1969 Maidstone was restored and re-commissioned as accommodation for 2,000 troops and sent to Belfast. In 1969 she arrived under tow at Belfast to serve as barracks for the increased security forces in the area. 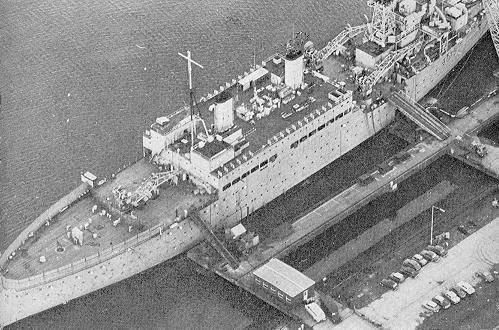 In 1971, she was used as a prison ship in Operation Demetrius as a place to hold internees without trial, including Gerry Adams. The holding area itself was at the stern and consisted of two bunkhouses, one up, one down, and two messrooms. Above these were the rooms of the governor and his staff and above this was the deck, used twice a day for exercise. The deck was surrounded by 10-foot-high barbed wire. She was moored in Belfast harbour 20 feet from the land, entry to the jetty being guarded by sand-bagged army emplacements. The Maidstone was also notable for a successful escape by seven Provisional IRA members on 17 January 1972. Click here to read a personal account of this escape. The men swam close to 300 yards through icy water and evaded army and police only to later hold a press conference. On 23 May 1978 Maidstone was broken up for scrap at the Thomas Ward scrapyard in Inverkeithing. 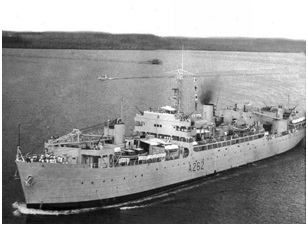 Along with HMS Maidstone, HMS Hartland Point was ordered to Belfast in 1969. Maidstone was converted for use as a prison while Hartland Point provided accommodation mainly for Royal Navy personnel and prison officers. Hartland Point was towed away from Belfast in 1979 and decommissioned.